Rebecca was up and out the door this morning at 6:00AM to catch the metro down to City Hall in Seoul. Today is the DMZ tour and it takes approximately one hour and ten minutes to go from our metro station to the City Hall station. What a trooper! She woke up with a very runny nose and stuffy head. It might be allergies, it might be just a plain old case of the Korean crud, either way I knew it was going to be a pretty rough day for her. Mr. B and I both had to finish out the work-week today. We were both delighted that Rebecca could go tour the DMZ and get a feel for the hope that exists for North Korea and South Korea to reunify. Rebecca said that the tour guide was a riot and reminded her of a little gangster when she used certain phrases or exhibited certain expressions. She thought to herself while on the tour that Id get a kick out of it. She knows me so well, I’m sure that I totally would have! Once we were all back home in the evening, We wanted to hear how the tour was. Rebecca said it was good however the visibility was much like that of looking at North Korea on a google map. Eeek! That bad?! Yes, the sky was rather gloomy all day and it definitely would have affects on the South Korea DMZ observatory. That mother nature can really be a Debbie downer sometimes…All and all, Rebecca and I both are grateful, we know it may be a once in a lifetime opportunity experience. Rebecca’s symptoms were definitely peaking in the evening and she was in dire need of some antihistamine or decongestant. We took care of her, many thanks to Mr. B, sometimes I am not sure what id do without this man folks, what a godsend. We hung out for a bit allowing the medication to sooth Rebecca’s system. About twenty or thirty minutes later she was actually starting to dry up a bit. She commented on how nice it was not to have to blow her nose every few seconds. The semi re-charged Rebecca bravely blurted that she could handle going for dinner when we were ready. Dinner, dinner? Did someone mention dinner? Mr. B’s ears were certainly perked at this point. All week Mr. B knew that Friday night dinner plans meant D-I-N-O-M-E-A-T-S,those words were magical to Mr. B. and he was up and about and ready to go in no time. Uh-oh Rebecca…hope you are ready for this place. We like to go to Dino Meats occasionally. Okay, okay, using the word occasionally very loosely here. 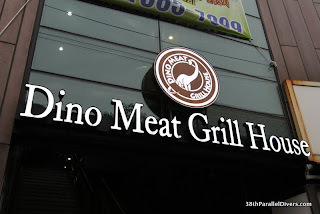 This is a restaurant that is very popular because of the copious amounts of meat that you can consume. You hand select every cut and type of meat that you personally will grill and eat right at your own table. You must take off your shoes before entering and you must sit on the floor. We enjoy seeing the reaction of people who go for the first time because of all the key items listed above such as the floor seating, all you can eat meat, grilling at your table, and removal of shoes. It’s fun! Mmmm Hmmm… we indoctrinated Rebecca right away. We let Rebecca hand select the first round of meats. We then proceeded to provide her with a gigantic lettuce leaf and let her go to town. Mr. B said she had to eat it the Korea way. The Korean way, she asked? Yes, prior to consumption, you take whatever slice of the cooked meat you like and place it on the lettuce, with some cooked rice, or any combination of the vegetable such as the sliced garlic, kimchi, mushrooms, bean sprouts, or grilled onions. The final step, roll everything up in the leaf, and shove the entire thing in your mouth. It sounds easy right? I swear, it’s some form of mastering food art. What a champ! She did it! Enjoyed it too! We giggled about how the first time Mr. B and I had to eat the meal this way we were trying to be all proper and have manners. Trying to perhaps tackle the leaf with some scientific approach and tear it in half, this way it would be smaller bites and smaller portions. WHOAAAAA!!! That wasn’t flying with our accompanying friends. When you are in a Korean “beef and leaf” restaurant in Korea, all the years you were drilled not to shove your mouth so full with food goes right out the window. Bellies stuffed to the gills we went home.